We take care of the organization from start unto return including return taxi or boat. You just need to book your downwinder and be on time at the meeting point (see table in "Itineraries") with your kiteboarding gear. 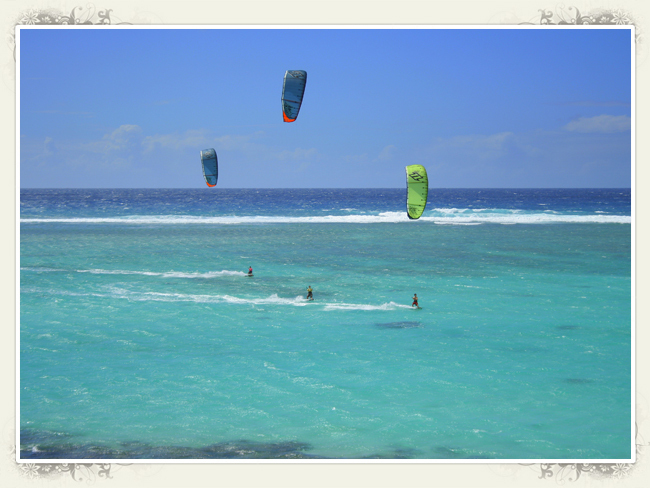 We can rent you some kiteboarding equipment if you ask us previously. We can also arrange Photoshootings for you, especially on the downwinder of the "Ile aux Cerfs" and of "Palmar - Poste Lafayette". You will pay after the downwinder if the photoshooting has been possible.The price is 50€ including all pictures of your downwinders, with Photoshop after effects, pictures of Mauritius, kitesurfing pictures, all pictures being copyright free, and shipment to your home of the CD with the pictures. Please check the under section of the "Organization" section for "Requirements", "Boat" and "Team".